Inventor Joe Woodland drew the first barcode in the sand in Miami Beach as he tried to come up with a way to help grocery stores process customers faster. Once this invention was established, the next hurdle was inexpensive ways to print the images with precise edges and customization. This is where thermal labels come in. Read on for everything you need to know about thermal labels, their uses and the benefits they offer. 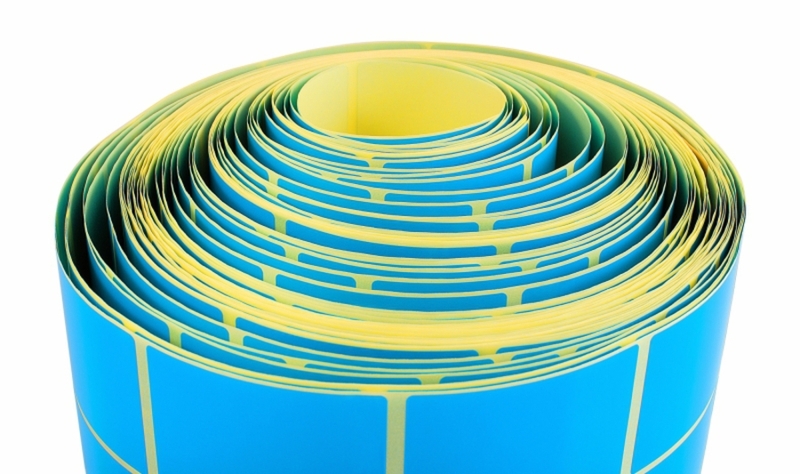 Thermal labels are printed by thermal printers without using use ink, toner, or ribbon. This makes them a less expensive option than other types of printing. The images produced are nice and sharp, with precise edges, and they are highly customizable. Let’s take a closer look at the top four benefits from using a thermal printer. With ink printers, it takes a few seconds for the printer to put the ink on the page. Though it may not seem like a long time, added up, this can be hours of wasted time a day. A thermal printer requires no ink so images are made in a fraction of the time. The retail benefits are huge. Faster checkout lines, faster shipping times, more customers served, more goods sold and more work done by employees in the same amount of time. Most printers require you to purchase either ink cartridges or ribbons. 942 million cartridges are sold each year. The cost can really add up. Even the cheapest ink, at about $13 an ounce, costs more than fine Champagne, while the priciest, at about $75 an ounce, is more expensive than Chanel No. 5 perfume. Ink cost $9,600 per gallon! THink of that next time you feel that gas prices are outrageous. What’s worse is that some of that ink never makes it onto your paper. It is used for cleaning the print heads and other maintenance chores. A thermal printer is inkless. It uses use heat to print images on the paper. By eliminating the need to replenish ink supplies, you’ll save thousands of dollars. Not to mention you’ll prevent a bunch of empty cartridges ending up in our landfills. Thermal printers don’t have as many moving parts as conventional printers. This means they are less likely to break. Also, with fewer moving parts, if something does go wrong on a thermal printer, it’s often easier, faster and cheaper to repair. You must have noticed that when ink is running low, the image is difficult to read. Conventional ink-jet printers are also prone to smudge if you touch the page while it is still wet. Thermal transfer printing has no ink so there is no chance of faded or smeared text. You will have clear, long-lasting images that can withstand UV rays and can handle some water damage. Now that we’ve explained the benefits of thermal printing, let’s look at some of the common uses for thermal labels. Shipping labels are one of the items that most commonly uses thermal printer paper. Labels can show barcodes, the shipper, recipient, and other shipping information, like how the package should be handled, stored and delivered. The high-quality images on thermal labels mean that barcodes and addresses will be easily read by hand-held devices and by shipping personnel. The thermal printer paper will ensure that the label remains crisp even when subject to heat, cold or rain. Pharmaceutical labels are a type of documentation that must be done right. A lot is at stake with anything pharmaceutical in nature which is why there are many regulations about packaging and labeling these products. Pharmaceutical labels may show information such as expiration dates, batch numbers, and dosage information. Millions of these labels are printed daily. A fast, efficient printing option such as thermal printers is a good way to keep up with the huge demand. Imagine the hundreds of millions of items for sale in retail stores across the world. They all have one thing in common? A price tag! Every piece of merchandise is tagged with a price, an item code, the size, and other information that identifies the product. Retail stores with a high turnover rate may be required to print hundreds of price tags each month. Accuracy and a cost-effective option are needed for this. Food and beverage companies use appealing food labels as part of their packaging marketing strategy. Thermally printed food labels are a cost-effective way to meet food labeling requirements. Virtually every product sold anywhere these days has a barcode. They speed up inventory tracking as well as efficiency in sales for retail businesses. Warehouses and manufacturers also use barcode labels in enormous quantities. There are two basic types of barcodes. Learn how to choose the barcode label for your needs. The biggest downside to barcodes is when they don’t scan. The barcode might be up to 12 numbers long, so if a cashier needs to manually punch these numbers in, it can be a waste of time. Using thermal labels guarantees razor-sharp edges for a barcode that scans, every time. Besides pricing information, product labels can provide information such as a serial number, model number, batch number and so on. Items stored in warehouses may have inventory identification labels to help keep inventory correct. Labels can also be used in the quality control or assembly line scenarios. Read why proper product labels matter so much. By now you can clearly see that the applications for thermal labels are infinite. Though a thermal printer may cost more than other types of printers at first, the time-saving measure, plus not having to replace cartridges make thermal printers the economical choice. If you count things, we can help. Contact us today.